Critters in the attic. We’ve dealt with critters in our attic time and time again. We’ve never actively sought out or caught the critters, as they typically leave on their own accord. Plus, on more than on occasion, my husband has found snake skin left behind by growing snakes. Perhaps the snakes were growing due to their consumption of the critters in the attic? Who knows. This weekend, I’ve been listening to the latest critter in the attic. With temperatures staying below freezing, I completely understood this fella’s need for shelter. However, I was a bit concerned by the size of the critter. He seemed to make the ceiling creak as he moved around in his usual area. The critter in the attic has been a source of entertainment for me, these past several days. I’ve been confined to my bedroom, as I battle with and recover from the flu. Because I caught the symptoms in time, I was a good candidate for Tamiflu, which I have been taking as directed. I laughed when my doctor told me about the possible side effects of Tamiflu. She said it might cause my behavior to become a little weird. While literally laughing out loud, I said, “I’m already taking Zoloft because I am ‘off’, and now you are telling me Tamiflu might make me more ‘off’?” Sure enough, straight from Tamilfu’s website: “People with the flu, particularly children and adolescents, may be at an increased risk of seizures, confusion, or abnormal behavior early during their illness. These events may occur shortly after beginning Tamiflu or may occur when flu is not treated.” Abnormal behavior. Hmmm … Define abnormal, because I don’t know that I have ever been described as being ‘normal’. Let me ask you, have you ever had a fever? Have you ever had a high fever? Well, if you’ve experienced the flu, you’ve probably experienced a high fever. And, I am willing to bet, if you’ve experienced a high fever, you’ve experienced a bit of delirium. It is my belief that one has a tendency to become a wee bit delirious when battling high fevers. And, when one is a wee bit delirious, one may start hallucinating. Well. I’ve been hallucinating. And, the critter in the ceiling has been adding to the hallucinations. Though, thankfully, the critter is not speaking to me. Yet. Every time I find myself dozing, I seem to be transported to a world where weird things happen. Sometimes I am transported to a world where normal things happen, only to find the normal thing didn’t actually take place. Case in point? While I was dozing, I could have sworn Rob came in to use the bathroom. I heard him. I was sure of it. And, I could tell he was going to be awhile, because I heard him light a match. 30 minutes later, I was growing cranky. I had to use the bathroom. I barely had enough energy to get out of bed, and because he was lolly-gagging in the bathroom, I was going to have to use the bathroom in the hall. Why – oh why – was he taking so long? I finally said, “Rob!” But I got no response. I sat up, and looked at the bathroom door. The door was open and the bathroom was empty. Was I hallucinating? And then there was the critter …. the noisy critter. I knew he was real. I heard him when I was awake and when I was dozing. He was in my real world – as well as my ‘other’ world. One of my friends suggested the critter was a raccoon. 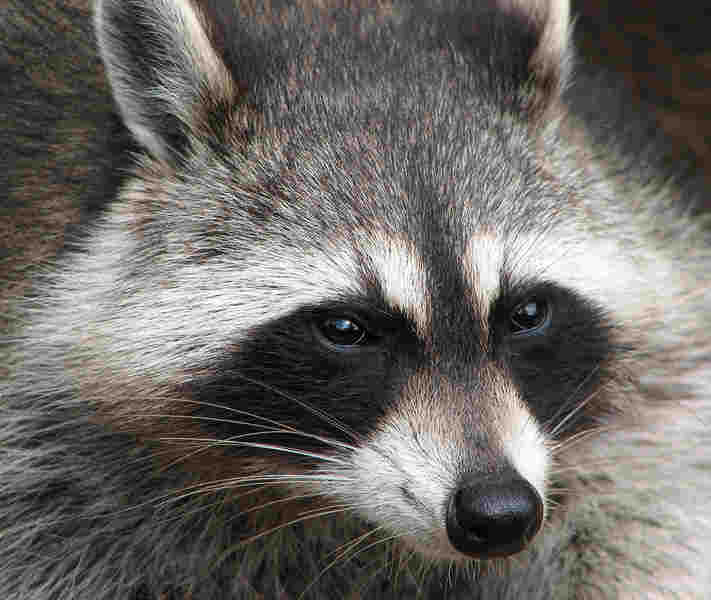 And naturally, based on her critter feedback, a raccoon appeared in my dreams. (By the way, he was not rabid, and he was cute.) I didn’t really think the critter was a raccoon, though. We live in a single story ranch, but we have a drive under garage that runs the length of the house. I know raccoons are climbers, but I don’t think our attic is easily accessible for raccoons. Squirrels and mice? Yes. But raccoons? It would be a first – at least for us. During the day, I heard the critter leave the attic. So I thought. I opened the blinds, in hopes I would catch the critter returning. When I opened the blinds, I realized the telephone wire to the house, might be the source of home access. Then I wondered if we had flying squirrels. My mind was racing – or was I merely hallucinating. Regardless, I resumed my spot on the bed and waited for the return of the critter. Then a gust of wind came . . .
With the gust of wind came the familiar nose made by the critter. I looked up to see the culprit! And, what to my wondering eyes did appear?! Well, as the pictures will show, it wasn’t the critter I had expected, but it was the source of all the noise I had heard these past several days. So, here’s to fevers, hallucinations and Tamiflu, because being ‘normal’ is no where near as exciting. The critter – disturbed with the gust of air. The critter flapping against the house and rattling the pole. Why? Why Am I Keeping These? Why?